During the ten years it’s taken me to write The Purple Crayon and a Hole to Dig: The Lives of Crockett Johnson and Ruth Krauss (forthcoming in 2012), I’ve gathered far more material than I can fit in the book. From time to time, I’ll post here some of what I could not include. Long before he thought up Harold and the Purple Crayon (1955) and Barnaby (1942-1952), Crockett Johnson was drawing cartoons. As a freshman at Newtown High School, Johnson — whose real name was David Johnson Leisk — became one of the artists for The Newtown H.S. Lantern. Indeed, he may have been one of the founders of this thrice-annual magazine. I have been unable to locate a copy of its first issue, but its second lists David Leisk is as one of three artists on the editorial staff. 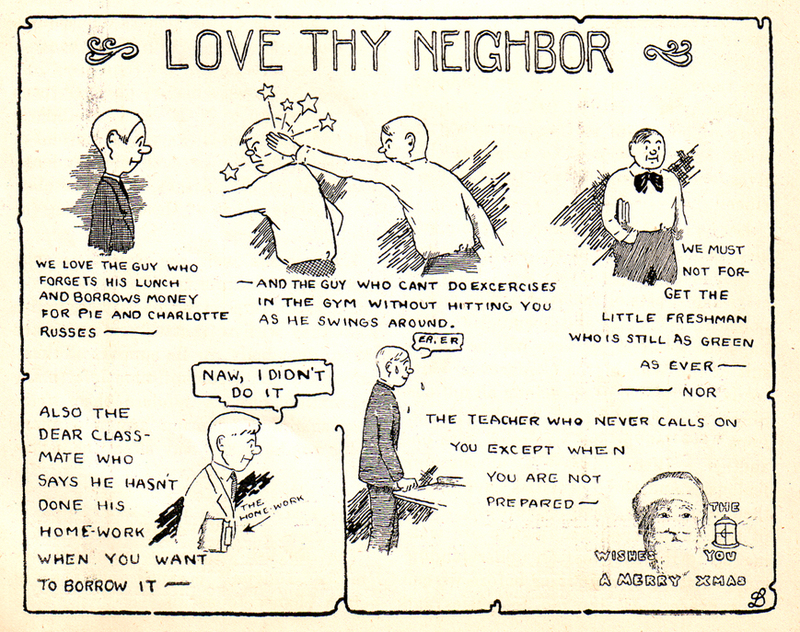 Published in March 1921, the Lantern’s second issue includes what may be the first published cartoon by Crockett Johnson. 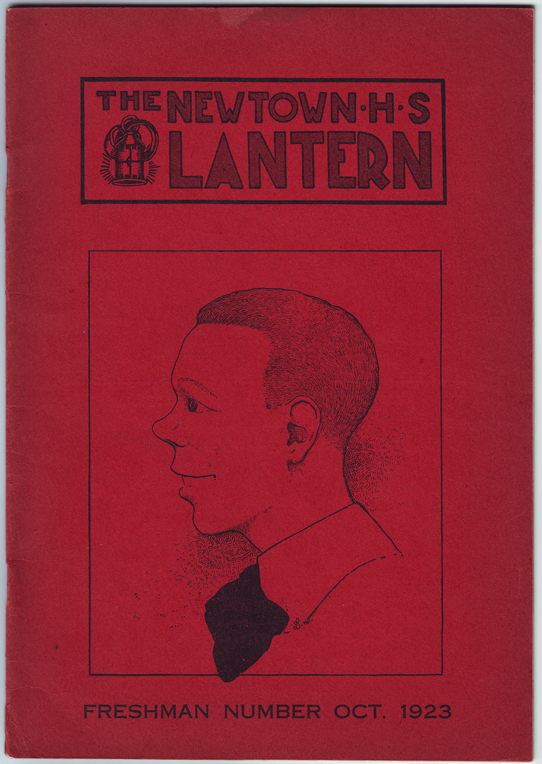 Published during the fall semester of his sophomore year, Johnson — a.k.a. David Leisk (note the signature of the cursive D transposed onto a cursive L) — conveys a bemused skepticism towards loving one’s neighbor. The 15-year-old sophomore dryly reminds us not to “forget the little freshman who is still as green as ever” because, you know, Leisk is now a full year older than those freshmen. As readers of his adult work will note, he’s not yet developed the crisp cartoon minimalism that will become the hallmark of his style. But all aspiring cartoonists and illustrators have to start somewhere…. Finally, I’ve started Facebook groups for both Crockett Johnson and Ruth Krauss. If you’re on Facebook, stop by.